The deadline has passed for online entries, but you can still enter using a printed form and submitting your own prints, as in previous years. This option has an extended deadline of noon on Saturday 1 June. For this, you will need to download and complete a hard copy entry form, obtainable here. FREE ENTRY until midnight 22 April 2019. After that, entries are £1.50 each for adults and 50p each for children. Questions or problems with this form? Call Martin on 07738 303901 for help. You can still enter using a printed form and submitting your own prints, as in previous years. This option has an extended deadline of noon on Saturday 1 June. For this, you will need to download and complete a hard copy entry form, available from early in 2019. If you are entering using this page and so will be uploading files for us to print, please read on. You may enter up to six images. Adult categories are priced at £1.50 each. 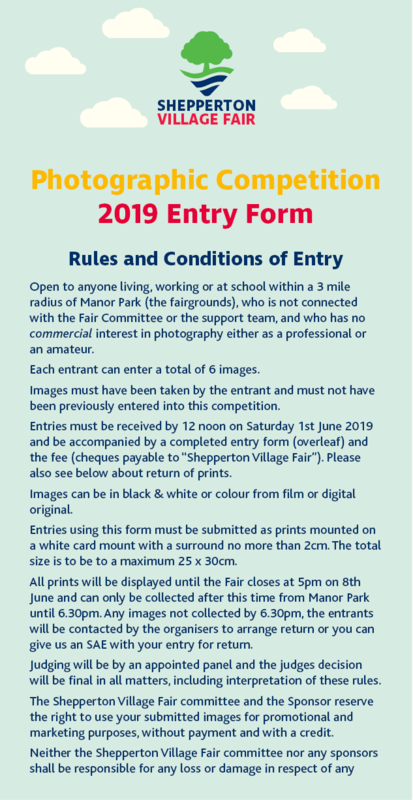 Child entries are 50p each (but free until 22 April 2019). When you first submit an entry using this form, you'll receive a link to enable you to edit your entries. This means you can upload, remove, change and generally curate your entries until the deadline. If you enter via this form and upload files we will produce prints 10in (25.4cm) longest edge with a narrow white border. If you are uploading a picture to enter from your phone, you may find it easier to complete this form on the same device that stores your image. You may enter an Instagram picture that you took, but you will need to make sure it is in a photo album on your phone or tablet first. Find out how to download your Instagram images to your phone or tablet. You can read the terms and conditions above. After you have completed the form and paid, you will receive an email with full details of your entry. After you have uploaded your first file, a second section will open, and so on, until you select "I have no more entries" from the drop down menu. When you click the Pay and Enter button below you will be taken to PayPal to make your payment. You will also receive an email confirmation. You don't need a PayPal account - you can also use your credit or debit card once you're directed to the PayPal site. You may print a copy of this form for your records using the Print Form button below. Connecting to PayPal can take a few moments, so please be patient.